I've been hearing about this project for months. Among the contractors with whom I work, it is known as 'The Job' and it kept many of them busy (and solvent) during a slow time. This week I finally had a chance to visit and photograph 'The Job' or, as it is more properly known, Villa Mundo Nuevo. I'm a sucker for a house with a name, aren't you? ...read what the books say and others tell you, then develop your own methods based on your experience. Learning from existing gardens and nature are certainly some of the very best ways to learn. And yet, remember that the greatest designers of our time have questioned traditional methods and taken risks. Take risks. Jarrod stretched himself far and wide for this project; not only did he sculpt the landscape, he has also designed and executed furniture, sculpture, water features and countless architectural details over the last two years. The construction team for 'The Job' also deserves major kudos. Jim Everett of Evland LLC was the Maestro, and did an amazing job of assembling a crack team of some of the best landscape contractors in the area, including Sam Whitney of Samscaping, Inc. and Dale von Dohren of Landmark Landscapes. It has been my pleasure to have designs built by each of these fine gentlemen, and thanks to them I have some nice awards hanging on my wall. As you look at the pictures, realize that this landscape was truly built by hand; there was no access for bobcats or graders. Every cut in the hillside was wheelbarrowed out and used to fill or build some other area; as much as possible was kept and used on site. Located up a windy mountain road, Villa Mundo wasn't hard to find; these sinuous Andy Goldsworthy-inspired walls at the street entrance take your breath as you come around a wooded corner. They are planted above with Agave, Aloe, Dasylirion, and Blue Senecio, and carpeted below with Echeveria, which were in full, simultaneous bloom. A beautiful specimen of Elephant Foot (Beaucarnea recurvata) on the opposite side of the driveway makes a dramatic focal point; I like how the hillside behind it was tamed with the same stone as the walls, beautifully blending the wild oak woodland with the more exotic new landscape. The long driveway is lined with Agave and Blue Fescue (Festuca glauca). Purple Smoke Bush (Cotinus coggygria) and Black Lace Elderberry (Sambucus nigra) form a rich backdrop amidst the native oaks. At the top of the drive, between the front retaining wall and the tennis court, are these elegant raised vegetable beds. The client's only requirement was that a copper band be incorporated into the design, to deter snails. These custom concrete planters with hammered copper insets that Jarrod designed are simple, functional, and brilliant. This is one of the two flanking the entrance that are two-tiered; fragrant citrus trees are planted on top. There are 8 beds of various sizes, and each are edged with a mixture of herbs and strawberries. The significant slope was leveled with fieldstone walls, and the existing Water Gums (Tristania laurina) were kept and pruned up to provide some protection from the strong noonday sun (while allowing plenty in the morning and afternoon to keep veggies happy). The opposite fence of the tennis court was planted with this impressive row of upright European Hornbeam (Carpinus betulus 'Fastigiata') which I'm SO going to use one of these days. Echium, Aloe and Agave complete the bed, which forms the backdrop of the new outdoor kitchen (still under construction). An existing bed of mature palms near the swimming pool is jazzed up by aloes, succulents and barrel cactus. Notice the narrow row of blooming succulents at the base of the stairs...wow! We marched right past the swimming pool, which was existing, to arrive at the part of the garden I had heard the most about; the raw hillside that became one of the most unique spaces I've ever seen. Three narrow terraces are treated three different ways, and are equally gorgeous when seen from above (the home has 3 stories with full balconies along this side) or from within. Every few steps reveals a different alignment of views, each lovely. This is a sign of good design, to me; that it works from all directions. The sweet shot where all aligns. The first stone-lined flume of the central water feature cascades over the steel wall to the lawn terrace, where it then slips under the concrete bridge and continues on, over the steel wall to the bocce court...but I'm getting ahead of myself. I love how the row of apricot trees at the very back provide the visual transition to the oak and bay woodland beyond; containing the designed space like a jewel in a box. The concrete shapes in the lawn are from one of Jarrod's drawings, and nearly all the lines are curves; according to Sir Jim, it took two weeks just to set the forms for them. And the steel walls! Thin textured panels face the massive concrete retaining walls. The engineering of all of this was no small feat, from the angles of the water flumes to the correct adhesive for the steel. Design Note; for safety the walls are going be capped, as the lower planting beds are, and will appear thicker. And I think it will be an improvement; even though it isn't weight-bearing, I want to see it as such! Another view showing how the slope relates to the house. The low, stainless steel planter next to the lawn has narrow LED lights that wash across the embossed lawn and softly illuminate the flower border opposite (I NEED to see this at night!) You can see that small gaps had to be left between the steel wall panels, to allow for heat expansion. The next level down is the bocce court, here getting its final 1/4" layer of crushed oyster shells (a big moment, and I was there!) The circular sitting area under the steel gazebo has a surface of tumbled glass from Building REsources, in San Francisco, which is a great source for reusable, recycled and remanufactured building and landscaping materials. And then there's the Cairn that Jim Built, as seen from the bocce court. Possibly my favorite part of the garden, as I'm a big Andy Goldsworthy fan. It was originally intended only as a focal point sculpture; until Jarrod and Jim wondered one day if they could run water through it. The rest, as they say, is history! I love everything about it, including the simple backdrop of ferns, artichokes and apricot trees. The cairn was built entirely by hand around a cement core. The stone starburst that Jarrod designed for its base is a masterful touch. A massive, multi-trunk live oak dominates the more naturally planted center of the slope; here another round patio of crushed glass is enlivened by these clever starbursts Jarrod designed, which are hung on cables from its large overhanging branches. The sleek Ipe wood stairs connecting the slope garden on both sides are brightened by risers made of the same textured steel as the walls; the contrast of materials is very satisfying. This set connects the lawn with the house, via a densely planted grove of Coral Bark Maples (Acer palmatum 'Sango kaku'). I loved this serene, shady flagstone patio, with its guardian statue, a Frank Lloyd Wright reproduction. And there's Jarrod, lurking amongst the maples; he has lived the project for over two years; what a thrill it must be to see his vision emerge. Emerging back at driveway level, the striking, lush entrance plantings greet you. Planted a year ago, the Loropetalum, Silver Spear (Astelia chathamica) 'Crimson Curls' Heuchera and tidy border of Echeveria are a perfect setting for Jarrod's sleek steel 'spray' sculptures. A pair of these custom steel fountains flanks the front steps, with black mondo grass planted at the base; an absolutely beautiful design, masterfully executed. Many thanks to Jarrod and Jim for taking the time to show me around. The landscape is about three months away from being totally complete, so I'll be back. Congratulations to the team and the creative and adventurous owners of Villa Mundo Nuevo for an incredible job that will no doubt be getting lots of attention. No doubt there will be lots of attention, and we saw it here first! Thank you. And I hope you get to see it at night, soon! On the Additional Credits, to be CLEAR, Jarrod designed almost every darn thing out there; I simply "amended" what were originally tables and drew up the transition to water pots for the front steps ... the REST is ALL Zeterre! Thank you for the compliments.... it really is a very special place. As you know, a garden like this doesn't happen without a perfect recipe: an eccentric designer like myself to design... clients who trust my crazy ideas and appreciate plants and art, and brilliant contractors who make visions and sketches come to life....oh yes, and the hardworking and very fun crews. Wonderful tour of "the Job" -- looks like a dream project to me. A garden like this doesn't happen without a whole heck of a lot of money either. It's an amazing place. I'm in awe of the scope of it. Thanks for the "first look"! This is a fabulous garden. Thank your for taking us on a tour, Laura. I love how it is both "architectured" and "horticultured" and think the two perfectly complement one another. Bravo to the designers, homeowners and installers. No equipment? Truly the work of expert craftspeople. Great "Job." Absolutely fantastic! My hat is off to everyone involved. Thanks for the inside look. Love the details but....so many ideas at once? Without a walk through to get the human scale of the property and the transition from space to space it's hard to imagine that its not just busy, busy, busy. Where's the cohesion? @Susan, for me the repetition of stainless steel, Ipe wood and ledger stone elements held the design together; my photos may lack some context as I was avoiding shots of the house, incomplete areas or bustling workers. In person, it works! This looks amazing! I especially love the fountains and I'm a sucker for a good Cascade Water Feature. What is even more impressive is that no heavy machinery or equipment was used at all. I wonder whether this makes a designers job easier or harder and if the vision is compromised because of it. Interesting point, Jayne. I think in this case the architect was able to stay true to his design; it's the contractor's work that gets harder! But if they are willing and able, and the resources are available to support the effort, there's little these guys can't do. And, of course, the crews are the hands and backs that actually do it, and with good direction they can literally move mountains! Idiosyncratic and dramatic, a garden with a definite personality. Love the wiggly stone walls. Looks like it would be a good place to set a film. What a marvelous job. The combination of all the elements is amazing. Wow - what a garden! The grass patterns are paticularly stunning - and the water features look great, very modern and contemporary. Laura has had a lifelong love affair with plants and gardens, both wild and domesticated, and all the creatures in them. She lives in Scotts Valley, CA (zone 9). She has a degree in Art History from UC Santa Barbara, and studied Graphic Design at UC Santa Cruz. She is also an alumni of the Horticulture and Design Program at Foothill College. Laura worked in high-tech marketing communications and advertising for years, until she had a midlife awakening and decided to become a landscape designer. 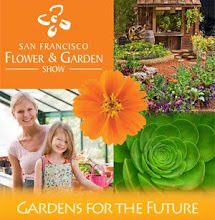 Her gardens have won many awards, including a gold medal at the 2005 SF Flower & Garden Show. Laura was also featured on four episodes of the HGTV backyard transformation show Landscape Smart, and was a guest artist on Curb Appeal. 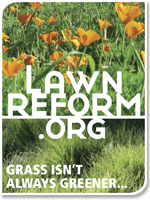 Laura is a past president of the largest Association of Professional Landscape Designers district in the country. 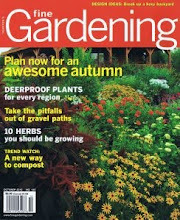 She is also a member of the California Landscape Contractors Association and the Garden Writers Association. Laura currently works in high-tech PR, but loves to consult if you'd like some great ideas! My garden is! Er, was! Still is! Is it too late to ask Santa for a rain barrel?